It's time for another picture from Portugal. I took this picture several years ago during my first trip to Porto, but didn't even see it until recently when I rescued it from obscurity -- literally. I took the photo around sunset and the image was so dark that it hadn't been printed, but was on the disc when I recently loaded it into the computer. I cropped it, enlarged it, and adjusted the light until I could see what I had. 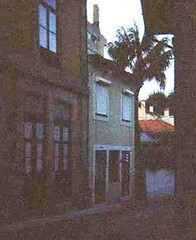 The soft and grainy image seemed to capture the sense of the old streets, where colors and edges are softened by time. Over the past two days, I have worked on this painting for my friends. I enlarged the side porch area, worked on the fence, and added a porch swing. There are more adjustments to come, and colors at the rear of the house are not the final colors, just place-holders to indicate where things are in space. As I learn more details and receive more family pictures, I am coming to understand a place I have never actually seen. (I am using a black and white photo, supplemented with later photos taken when the house was white.) So when I finally received some old family snapshots, some of which were in color, I had the strange sensation that something I had painted had come to life. Today I used my phonecam to take this close-up of lilacs at Long Hill Gardens. The lilacs' familiar scent immediately transported me to the house where I grew up. (Do lilacs do that for you?) My grandmother's lilacs were the backdrop for many family photos. 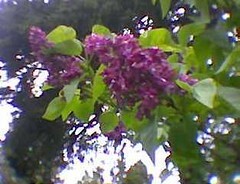 Even now, whenever I see lilacs, I have to get in close and inhale their perfume. This is the latest version of the painting for friends. I have recently done a "demolition and renovation" of the rear of the house. 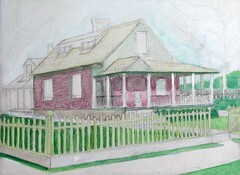 I am painting from an old black and white photo in which the back of the house is obscured with vines. To my eye, the vines and shadows created the optical illusion that the rear of the house was at an angle to the front. Recent photos finally helped me see the structure: a classic case of painting what you see versus painting what you know. This is now a composite that reconciles seeing and knowing, old and new. I adjusted the perspective slightly to include details that matter, even though they might not be visible from this angle, strictly speaking. Visual illusion in the service of emotional truth. This was taken during our trip to Brasil in 1994. Today, I scanned it into the computer and edited it for composition. 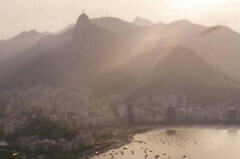 Rio de Janeiro and Brazil are such magical places that it is hard to leave, even if you aren't born there. Maybe that's why the Portuguese language has the most powerful word for homesick: "saudade". And maybe that's why they say "ate logo" (see you soon); they know you will come back to Brazil, sooner or later. And we will. . . I will soon post pictures from our trip to Goiania and Brasilia. . . Here is today's version of a work in progress, a painting for some friends. The long-distance dialogue continues, with e-mailed photos of elm trees, and as well as old family pictures that show details of the house. My friends have made several trips to take additional pictures of the house as it looks now, too. It is fascinating, and worth doing. In fact, a photo that I received in today's e-mail clarified the structure of the back part of the house, so tomorrow I will be doing some demolition and remodeling as I rework the back part of the house. But it will be quick and painless. No dust, no noise, no building permits: just paint. Boston is having a spring Nor'easter, the kind of storm that brings us wrap-around blizzards in the winter. Today, the temperature is in the forties, with high winds and rain. So I thought I would post an image that goes with the weather. 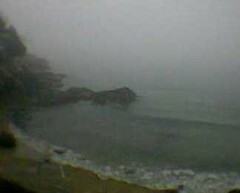 I used my phonecam to take this picture of the beach on the North Shore on another rainy day, about three weeks ago. Although the weather was not as severe then as it is today, even in this image you can see how stormy weather transforms the coast into something mysterious and wild. 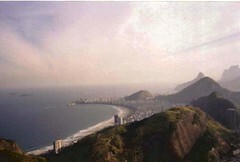 Today I scanned in and edited this image from a photo taken during our 1994 trip to Brazil. It's a view of Rio's Lagoa and Corcovado from a vantage point half-way up Pao de Acucar. I remember how lucky I felt to be there. My Brazilian connections have lasted for years, but began with coincidence and random events. As a result, over the years I have tasted mango and guarana, learned the meaning of churrasqueria and feijoida, made brigadeiros and olhas da sogra, danced samba, listened to tropicalismo, and even learned Portuguese. More important, I learned to respect the potential in coincidence, because fantastic things can happen if you keep your mind and heart open. This is a work in progress. 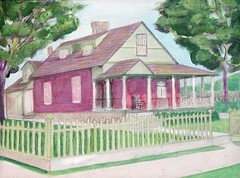 Tonight I worked on this painting for my friends and blocked in trees, upstairs windows and back part of the house. I am not trying to match the original colors of the house yet, but am using color to indicate location of objects as well as light and shadow. 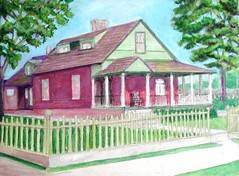 For example, the brick walls will not be this color in the final painting, but the red may show through a bit. Right now, you can see yellow and purple in the trees, which I am using to block in light and shadow in the foliage. Later you may still be able to find yellow and purple there, but only if you are looking for them. . . .
To celebrate connecting and re-connecting with Brasil, here's a photo of Rio taken in 1994 during our trip. Today I scanned the image and cropped it to improve the composition. 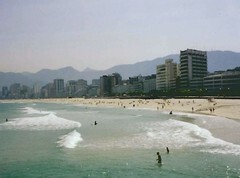 In Rio, we stayed in a hotel not too far from the beach, in Mauro's old neighborhood, so it was easy to meet his family. And the location also made it easy to re-connect with family of our long-time friends from Goiania. 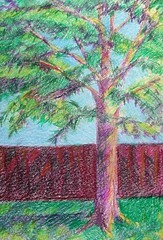 The trip to Brazil was far too short, and the trip to Rio just a blink of an eye, but my Brazilian connections are "for keeps"
This morning, I sketched this elm tree, using colored pencil sticks. 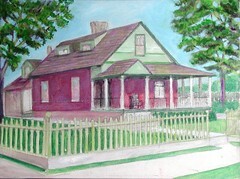 There aren't many elm trees around anymore, but there were elm trees planted around the house I am painting for my friends. I have a black and white photo of those trees, but there are only a few leaves on the branches. 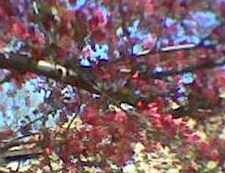 But my friends have sent me some photos, and I used my phonecam to take pictures of an elm tree that found by accident while I was out walking one morning. I like the colors the sun makes on a tree and the play of light and shadow on the ground. This morning, I had a chance to work on this painting for my friends, so I am posting an update, even though (especially because) there will be changes. As an artist, I love to watch art in process. I used to feel self-conscious when people watched me paint, but I guess I am over that, since I am posting this. Today I blocked in some trees and added some detail to the windows, using photos that my friends have emailed. We have been exchanging pictures and ideas about landscaping too: elm trees, spirea and roses. With vines or without? I suggested that we try some vines, and if they don't like them, I will paint them out. These vines will be easy to get rid of, unlike the vines in real life. Some things are easier in art. 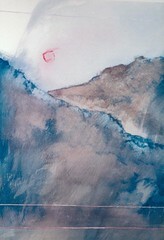 This is another from my series of watermedia paintings inspired by the Colorado mountains. I have been thinking that it is high time to post another Colorado painting, and then during the late afternoon, we had rain while the sun was shining, and that is such a Colorado thing that the issue was decided. I started painting the Colorado mountains when I moved out of state and no longer had the luxury of seeing them every day. Sometimes art can take you home. We took the dogs to Long Hill this afternoon for a quick walk through the gardens. 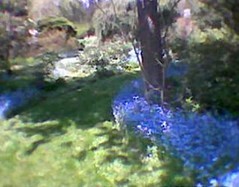 We didn't have much time, but time enough to glimpse this path lined with forget-me-nots. It made me stop in my tracks and take a quick photo with my phonecam! Later, I cropped the image just a bit to improve the composition and remove excess blur on the edges. I love the phonecam's spontaneity, despite its characteristic low resolution. Sometimes this problem can even create interesting effects, such as the dream-like quality of this unforgettable path. This is a work in progress, a painting for friends. So far, this is a sketch with some color blocked in with acrylics. 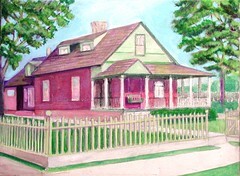 This is a childhood home and my friends are two time-zones away, so this involves long-distance art as well as time-travel. My friends scanned and e-mailed me a black and white photo, my main source of visual information, supplemented by phone calls and e-mailed color photos of the house as it is now. I have been sending digital photos to my friends as I draw, and making changes based on their feedback, which I expect, because when it comes to the house you grew up in, the more you see, the more you remember. We are really building the house together, with art and memories. I will post more later. . . Here's another view of Rio, taken from a cable car to Pao de Acucar, an amazing surprise arranged for us on our first day in Rio. To get to the top takes two connecting cable cars. 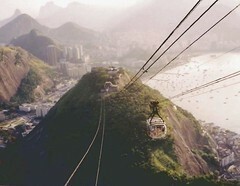 Heights make me nervous, but I was so excited to be in Brasil, the company was great, and I wasn't about to miss this. Still, I wasn't sure if I would be able to breathe, let alone take pictures. But the camera provided a focus, and calmed me down. I am so glad I went! Now, whether its a New York skyscraper, a castelo in Lisbon, a cliff in Northern Ireland, or a castle wall in Scotland, I carry a camera. More art, less fear. 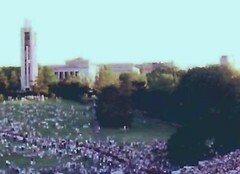 This photo of the graduation procession at the University of Kansas was taken years ago. Today I scanned the photo, cropped this image out of the background, and colorized it just a bit with Painter to make the campanile and other buildings stand out against the sky. I heard from some former KU students just yesterday, and started thinking about graduations. (It's graduation season, anyway). Graduation is a time when people think they are saying goodbye, but remembering KU graduation always reminds me that it is possible to stay connected despite time and distance, which has been a very happy surprise in my life. It was very late in the day when I looked up from the computer, and was surprised to see that the sun had come out (I hadn't noticed) and its the low rays were hitting the new leaves on the trees. (I had been too busy to look up.) 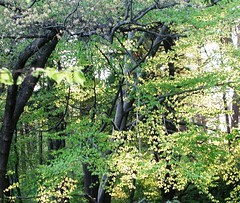 After the long winter, the trees are leafing out in New England, and that is worth noticing, so I grabbed my digital camera and headed outside. Robert Frost wrote, "Nature's first green is gold." Like art, poetry reminds us to pay attention. I am posting this today because Mauro is flying down to Rio de Janeiro to visit family. 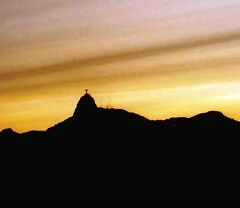 I took this photo in Rio during a long overdue trip to Brazil in 1994. Despite very close connections with people from Brazil, we had never managed to get there. Sometimes when people would ask, "Have you ever been to Brazil?" I would answer, "No, but Brasil has come to me." We finally had a nice warm day yesterday, and the crab apple trees decided to bloom. I took a picture with my phonecam, then cropped the image this morning. It is hard to get a crisp picture with a phonecam, and you get even more blur if you crop the image, but in this case, I liked the impressionistic effect. This is a view of a colosseum in the middle of Oban, Scotland, a fantastic image in its own right. A few days ago, I saw other images of the Oban colosseum when I stumbled across a Rick Steves TV program about Scotland. I looked in my photos from last summer, and found this image in the background of one of them, so I cropped and colorized it to enhance the sense of surprise that I felt when I first saw the skyline of Oban. This is a photo I took with my phonecam on Mother's Day, when I went for a walk to listen to music (enjoying one of my Mother's Day gifts). Although the weather wasn't the best, the music seemed to make everything look brighter. On the way,I stopped to take pictures. 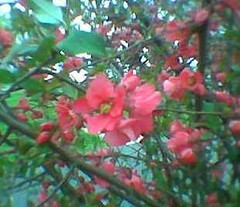 I love the color of flowering quince; there was flowering quince in my backyard in Lawrence, Kansas. Among yesterday's events was a happy call from Portugal that made me think of this image. This is one of my first pieces of digital art, created soon after my first trip to Portugal. I was drawing from memory and imagination, and the bright colors reflect the feeling of the trip, more than the actual colors of the buildings. 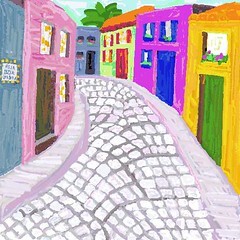 But the drawing is inspired by a real street in the Foz, in Porto, called Boa Vista (Good View). (If you look closely, you can see the street sign in the drawing.) I always thought that was funny. Are there any bad views in Portugal? Not to me! 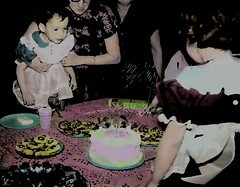 Tonight I edited and colorized an old family snapshot to get this image. The little girl in the red dress is me; the little girl in blue is my cousin, and my mom is holding my cousin as she blows out the birthday candles. My cousin and I grew up in the same house, more like twins than cousins. Once at a birthday party, one of our committee of parents picked up the wrong kid when the moment came to blow out the candles. This image is going to be a birthday greeting for my cousin, but I am also posting it here in honor of the mother of the little girl in red, as well as the mother of the little girl in blue. The weather is as bad as was promised, with cold rain and wind. 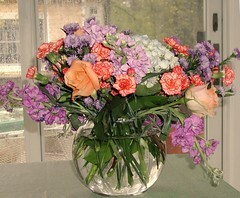 But these flowers arrived, an early Mother's Day surprise. It is a challenge to capture the amazing colors on such a dark day. In any case, I like the contrast of the bright flowers against the rainy window. When it seems to rain too much around here, people say that you can't have flowers without the rain. Today I had both. Local meteorologists are apologizing for the weather for the coming weekend. It is already cold, overcast and almost misty. But I will seize this opportunity to post another photo from my excursion in the fog last Sunday. 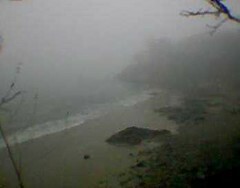 I took this picture with my phonecam, looking down on the beach from Route 127, just north of Beverly, MA, near Endicott College. Today I cropped the image just a bit to improve the composition. I like the way things look in the fog; the mist makes you look harder and see things differently. As a result, sometimes you see more clearly, not less. 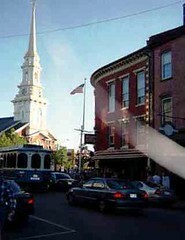 Today I found this picture of Portsmouth, New Hampshire, taken a few years ago. I like it because it captures the liveliness of the town, and the combination of old and new, from the motorcycle to the church spire. Tonight I edited the picture to improve the composition and to capitalize on some of the accidental effects: the arc of the reflection that mirrors the curved line of the wire, and the dark foreground that seems to call attention to the church. In studying art, especially watercolor and raku pottery, I learned to be open to using what happens in the best possible way, from the intentional to the accidental. By special request, here's a photo of Belfast. 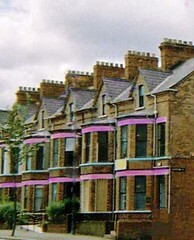 There are lots of rowhouses in Belfast, and I love the elaborate chimneys. I cropped this image out of the background of a photo I took there last summer. I wasn't happy with the composition, so I moved a car and tampered with a lamppost (through the magic of digital editing and Painter IX). Then I added a little color to emphasize the patterns on the houses. (Well, it's my fantasy, so I can do that.) But its fact, not fiction, that Belfast is a great place to visit. Don't miss it. 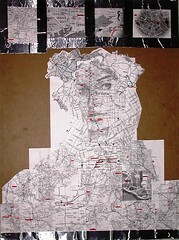 This collage self-portrait is made of maps of places that are important to me, places I have lived or visited (Colorado, Kansas, Portugal, Chicago, Brazil, etc.) This was an assignment for a collage class several years ago (pre-Belfast, which is why it is not included). I drew my face freehand, using an old photo as a reference, over a map of Colorado, and used maps for the hair, the figure, and the border at the top. I used cardboard and tape because this is about moving and change. I have moved often, and each time I was sad to leave, but each time I moved I also met people who became very important to me. The places and people I love became part of who I am, hence this image. It's May and time for some flowers. 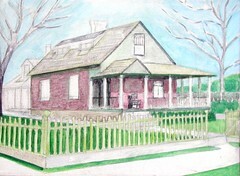 I painted this watercolor last summer, and took a digital photo of it a few days ago. 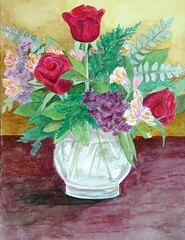 The bouquet was my daughter's, and the arrangement was more complicated than I thought when I first decided to paint it, which is almost always the case. The day seemed gloomy and foggy this morning, so I decided to do something to change it. 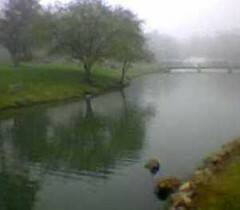 I drove to Endicott College, and walked around the campus, using my phonecam to take pictures of the great scenery in the fog. This is one of several photos that I took there today. My mood lifted before the fog, and I had many terrific surprises on what finally turned into a sunny day.